Lake Como is worth the hype. George Clooney, I get it. I would happily live in one of those villas for the rest of my life. I don't know why I go to cities when amazing places like this exist. Combined with the beautiful Italian architecture and with the Mediterranean feel it just doesn't get any better. We drove south from Stuttgart, Germany and drove right through Switzerland and into Italy. It's amazing how much the scenery changes. Going from farmlands and an Alpine type of climate to a more humid and warmer climate with palm trees and completely different landscaping. It's surreal. The drive is, of course, really beautiful and we passed many large lakes and mountainous areas in Switzerland. If you ever are traveling through Switzerland just know that there is a 40 CHF decal you must buy for your car. Also, unlike Germany, speeding tickets are not cheap so be sure to watch those speed limits. Below is one of the many wonderful views from our hotel balcony. We stayed at Hotel Bellavista and had a large balcony overlooking the expansive lake views and mountains. If you're in Lake Como, spend the extra money for the lake view because it is absolutely worth it. Below: View of Menaggio, the town we stayed in, from the ferry. It's very easy to take your car on the ferry from Menaggio to Bellagio or Varenna. They run frequently throughout the day, stopping around 5-7pm depending on which town you're in and where you're going. They even load large tour buses onto these car freights. I see why Rick Steve's recommended Varenna as the place to stay at Lake Como. The town is pedestrian only with hilly narrow cobblestone streets lined with shops and restaurants. The feel of the town is serene and peaceful. I am telling you I could stay here forever. Give me mountains and a lake and I'm in heaven. Below is hiking up to the castle above Varenna. You can see the town of Varenna with the church steeple to the right and Menaggio across the lake. Bellagio is also fantastic. 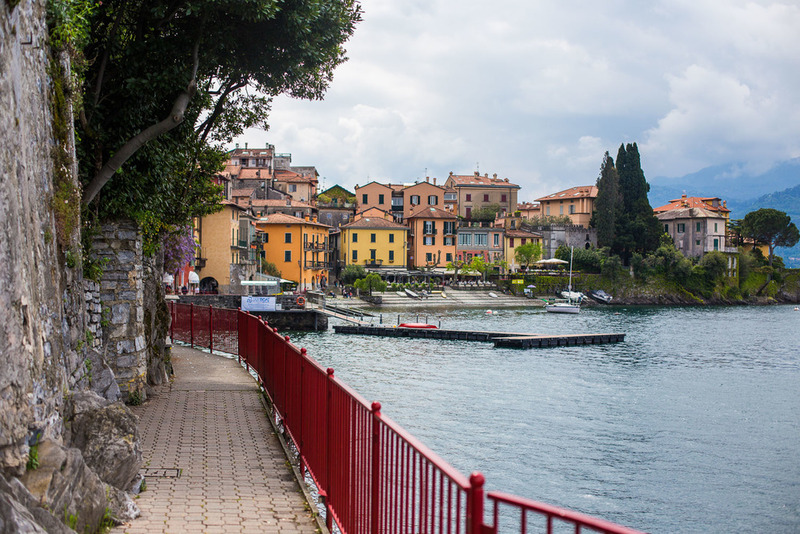 Truly, whether you decide to stay in Bellagio, Varenna, or Menaggio you can't go wrong. I'm writing this because I scrutinized each town and scoured the web trying to figure out which is 'best'. I can't tell you how many fodors and trip advisor reviews I read trying to find the best town. There is no best, they're all fantastic. Don't be like me and worry about it, and plus the ferries are quick and you can visit all the towns in one day if you like. The evening view from our balcony. Just...wow. Ciao for now Italy. I will be thinking fondly of you often and dreaming of the next time I will be back.